This article will introduce IM-Magic Partition Resizer Server for Windows Server 2003 users to extend partition when there is low disk space on system partition. Download IM-Magic Partition Resizer Server to extend partition on Windows Server 2003 so as to resolve low disk space issue on system partition. Windows Server 2003 system partition hold operating system related program and data, so it is quite important on computer. IM-Magic Partition Resizer Server is partition software that is able to resize disk partition on Windows Server. With this partition software, you can extend system partition, shrink partition and move partition on Windows Server 2003. This partition software supports to resize NTFS and FAT partition without rebooting your computer. Download, install and run IM-Magic Partition Resizer Server. 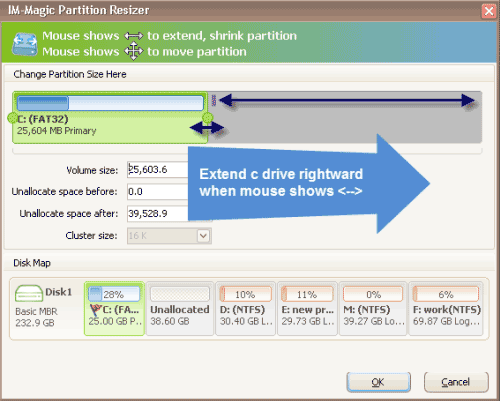 Right click a partition that has large free disk space and choose "Resize/Move" option. When you see the mouse shows double arrows symbol, you can shrink the partition to produce some unallocated space. Move the arrows when mouse shows double arrows symbol, and then click "Apply" button to apply all pending changes. The sufficient space on system partition can ensure the good performance of system, so to some extent, system partition have some influence on the performance of your computer. When system partition is running out of disk space on Windows Server 2003, your computer might run into a lot of trouble such as system corruption, black screen, blue screen, data corruption, and more. To avoid the unexpected trouble on your computer due to low disk space problem, Windows system often pops up low disk space warning to alert you to delete or move files to release space on the system partition. Therefore, you cannot ignore it when PC shows low disk space warning on system partition on Windows Server 2003. When receiving low disk space warning on Windows Server 2003 system partition, you can extend the partition by using IM-Magic Partition Resizer Server. You can extend system partition no matter it is FAT32 file system or NTFS file system without rebooting your computer. In addition, you don’t need to delete, move or backup any data on the disk, because IM-Magic Partition Resizer Server is able to extend disk partition without touching original data on the disk. As long as there is unallocated space on the same hard disk, IM-Magic Partition Resizer Server can meet all your need to extend system partition for Windows Server 2003. Is There Any Other Method to Extend Windows 2003 System Partition? "Windows 2003 shows low disk space on system partition, so I want to extend the system partition. However, I have no idea how to extend a system partition. I don’t want to use third-party partition software because I think it is expensive. Can you please tell me is there any other way that I can extend system partition on Windows Server 2003?" "Please help me with system partition resizing on Windows Server 2003, because it is running out of disk space. I always receive low disk space warning when I boot my computer. I tried to open Disk Management to manage the disk partition, but I didn’t find a useful way to solve the low disk space problem. 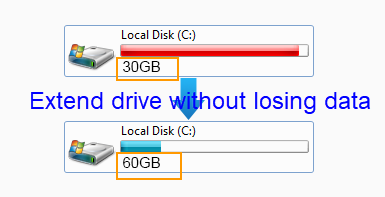 Does anybody know how to fix low disk space on Windows 2003 system partition?" Some users know the way to extend disk partition by running Diskpart command on Windows Server 2003. It is true that Diskpart command on Server 2003 can help you extend disk partition, create partition, format partition, delete partition, etc. However, unfortunately Diskpart command is only helpful with NTFS partition extending. In another word, you cannot rely on Diskpart command to extend system partition or FAT32 partition.